Put all ingredients except chicken in a plastic bag and knead to mix. Add chicken and turn bag to coat pieces. Marinate at room temperature for 30 minutes or for several hours in refrigerator. Remove chicken from bag and arrange, skin side up, in a shallow roasting pan. (I prefer my glass pyrex) . Bake in preheated 375 degree oven for 55 minutes. This looks excellent! I'm going to try it with tofu instead of chicken (just because). I'll let you know how it turns out. This is one of the simplest and tastiest dishes you will make. It's not really classic Thai, but one of those funky dishes that somehow just tastes great and is really satisfying. Wonderful as leftovers. I made this for dinner tonight. I had to make a few substitutions based on what I had on hand. 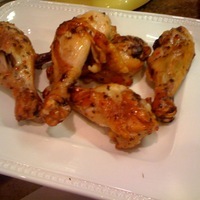 I substituted drumsticks for the thighs, lime zest and juice for the lemon and buttermilk for the yogurt. I realize the yogurt is probably really important to the recipe but my kids were napping and I couldn't run out. Even with all the substitutions the dish was great. My picky 3 year old even ate it! My husband said he'd like it again. Yeah! An easy dish that's delicious and my family likes. I served it with sticky white rice (I flavored with lime zest also) and sauted spinach. I love this recipe! Bart loves it, too! I actually tried this yesterday dinner, and it was awesome! Exceptionally good with a glass of red wine. This is a very easy dish to make, and it will leave your family/guests wanting more. If you are lucky enough to have leftovers, it makes for an amazing lunch the following day. I loved this recipe, it was very tasty. I hate fish sauce so I used light soy sauce instead and it was great. Easy to prepare and very tasty!! I just registered with Cook Eat Share yesterday and this was the first recipe I tried. Yummy! This recipe is amazing!! I will make this again!! I didn't have time to marinate, so I basted with the marinade every 10-15 min, and it created a wonderful carmelized coating. Delicious!! So that will be my new way of cooking this recipe. Made this on Saturday. Brought the leftovers into work on Monday and it was still wonderful. It was very easy. I will make this again! This was fantastic - even my pickiest eaters liked it! I will definitely be making it again!! my picky fiance actually loved this dish! two thumbs up! This is wonderful and easy. I have been trying to cook more at home. Husband does not really care for overly spicy (red pepper flake or cayenne pepper) food so I cut the amount of red pepper to about a quarter teaspoon. He loved this. Will definitely make again. We loved this recipe. Only change was only 1 tsp of red pepper flakes. This recipe will be on my next dinner party list. Cooked this recipe again last evening and company loved it. I think this recipe will be on my regular menu. Thanks for sharing it. This recipe is easy and I love that I can marinade it the night before! My kids love this!!!! my family loved this! I didn't have lemons so I substituted limes & I didn't have pepper flakes, so I substituted a small amount of chili pepper and it tasted great! Super flexible recipe. This chicken is bursting with flavor! My husband loved it, but the kids complained that it was too spicy. I recommend using only one teaspoon of hot chili flakes if you'll be serving to small children. I will definitely be making this again! WOW! That chicken was excellent and something different- I didn't have yogurt and I used Sour Cream to give it a cool and thick consistency- it worked for me! Hi Nancy I tried Thai basil chicken recipe and are very good, and very nice to serve for a family or friends party. Sound tasty! I would put this on my soon-to-try dishes. Thanks for sharing. I made this dish for the umpteenth time a few weeks ago. I was making it for several people as a "drive by fooding" (a silly tradition with my friends). I also took two HUGE containers of the chicken and rice (mixed together) to work for my doctors and colleagues. This recipe has made me VERY popular at work and I gave this recipe out to 20 people. Of course I gave you full credit. Thank you for sharing this delightful recipe with all of us. A must have for any kitchen if you ask me. Nancy, I made this dish for the umpteenth time a few weeks ago. I was making it for several people as a "drive by fooding" (a silly tradition with my friends). I also took two HUGE containers of the chicken and rice (mixed together) to work for my doctors and colleagues. This recipe has made me VERY popular at work and I gave this recipe out to 20 people. Of course I gave you full credit. Thank you for sharing this delightful recipe with all of us. A must have for any kitchen if you ask me. Hi nancy,read your receipe and it seemed to that is more indian than thai. Nonetheless, it must be great haven't tried it so far.